A 37-year-old man has been charged after a man was stabbed in the street in broad daylight. Stuart John Parkinson, 37, of Enid Place, Barmfurlong has been charged with section 18 assault. He appeared at Wigan Magistrates today (Friday) where he was bailed to appear at Liverpool Crown Court on Friday, September 2, 2016. 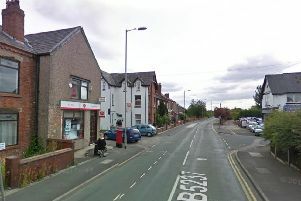 At around 11am yesterday (Thursday) police were called to reports that a man had been stabbed on Liverpool Road, Platt Bridge. A man was detained at the scene by an off duty police officer who was in the area at the time, before on duty officers attended and arrested the man.